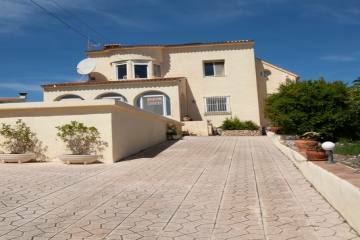 Completely refurbished Villa with sea views located on the Cumbre del Sol walking distance to amenities and close to the beach of Moraig. The Villa consists of a living room with a built-in pellet burner, American kitchen with all appliances, Glazed in Naya (terrace) serving as the bright dining area with direct access to the 8x4m pool and pool terrace, 3 double bedrooms with build in wardrobes, 1 bathroom and 1 shower. The outside area has a lovely garden with Mediterranean plants and different chill-out area to sit as well as a summer kitchen. From the garden, you have access to a guest apartment that has a living area with a kitchen, double bedrooms and a shower room, large storage and a laundry area. Other features are; a drive with a carport, partially air conditioning, LED light in the pool, outside shower, electric radiators, fans with remote control. The property is also close to the Lady Elizabeth School.